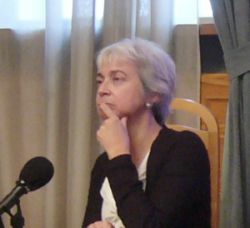 Marian Schwartz is a prize-winning translator of Russian fiction, history, biography, criticism, and fine art. Her most recent book translations are Mikhail Shishkin's Maidenhair (Open Letter Books), Leonid Yuzefovich’s Harlequin’s Costume (Glagoslav), Andrei Gelasimov's The Lying Year (AmazonCrossing) and Aleksandra Shatsikih's Black Square (Yale University Press). She is the principal English translator of the works of Nina Berberova and translated the New York Times’ bestseller The Last Tsar, by Edvard Radzinsky, as well as classics by Mikhail Bulgakov, Ivan Goncharov, Yuri Olesha, and Mikhail Lermontov.